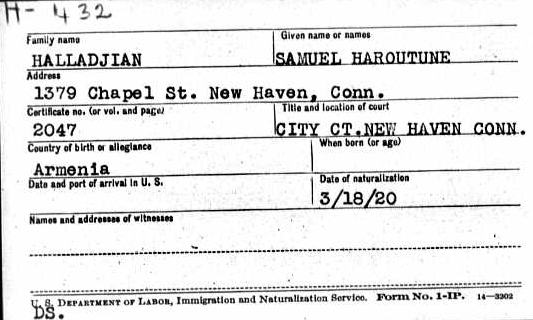 See Samuel's naturalization record here! Listed as Samuel Hallagian and his wife, Arshaloysh. Samuel was listed as the owner of the house at 31 Everett St., Arlington. Listed as Hallajian, Samuel H., Rev. and Arshalvice S. He was Pastor of Congregational Church, Porter Square, Cambridge, MA. [S369] Selected U.S. Naturalization Record Indexes, 1791 - 1966, Ancestry.com. Selected U.S. Naturalization Record Indexes, 1791-1966 (Indexed in World Archives Project) [database on-line]. Provo, UT, USA: Ancestry.com Operations, Inc., 2010. This collection was indexed by Ancestry World Archives Project contributors. [S24] Miscellaneous, Koolakian, Robert George. "Struggle for Justice", Wayne State University Press, p. 57. [S86] ua, Connecticut Federal Naturalization Records. [S86] ua, U.S. City Directories, Arlington, Mass. Page 543. [S9] Family Search (Church of the Latter Day Saints), "United States Social Security Death Index," database, FamilySearch (https://familysearch.org/ark:/61903/1:1:J56B-MWT : 20 May 2014. [S86] ua, U.S. City Directories, Lothrop's Arlington Directory, Page 227. [S449] 1940 United States Census, 1940 United States Census., Los Angeles, Los Angeles, California, ED 60-386, Page 9A, Dwelling 336.